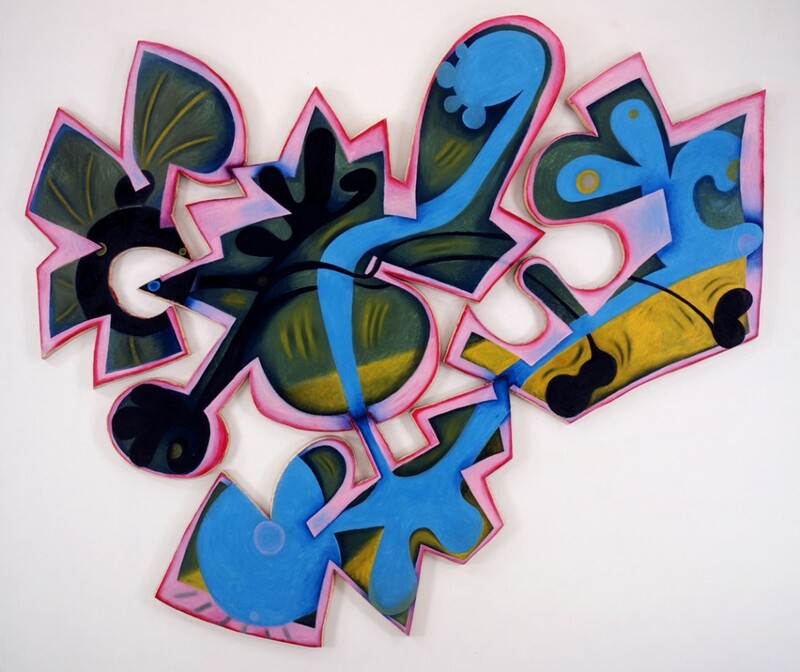 Elizabeth Murray, "Landing, 1999." Photo: Nerman Museum of Contemporary Art. In this week’s roundup Elizabeth Murray lands, Iñigo Manglano-Ovalle and Jessica Stockholder speak, Mark Bradford and Paul McCarthy highlight L.A., and more. Don’t forget to mark your calendars to view William Kentridge: Anything is Possible about the life and work of South African artist William Kentridge on October 21! Check your local PBS listings for times. A Nancy Spero retrospective will soon be at the Centre Pompidou (Paris). The exhibition will feature her monumental masterpiece Azur and is on view October 13 – January 10, 2011. Iñigo Manglano-Ovalle highlights his recent work about natural and constructed phenomena, including climate change as part of a lecture on Tuesday, October 12 at the Kellen Auditorium, Sheila C. Johnson Design Center, Parsons The New School for Design. The event is 6pm – 7pm and admission is free. Mark Bradford has a solo exhibition at the White Cube Hoxton Square (UK) which features the artist’s painting, collage, sculpture, film, and performance. The Pistol That Whistles explores ever-changing conditions and spontaneous networks in urban societies, e.g. Los Angeles. The exhibit is on view October 13 – November 13, 2010. Paul McCarthy is currently on view at L&M Arts Los Angeles. Three Sculptures is an inaugural exhibition that includes new large-scale sculptures, both indoor and outdoor, of all different mediums. The exhibit is on view through November 6, 2010. MoMA’s Modern Mondays will premiere Island Universe (2008) by Josiah McElheny, which is a film that explores the origins of the universe as embodied in J.&L. Lobmeyer’s famed Space Age chandeliers for New York’s Metropolitan Opera House. The screening will take place on November 8, 2010. James Turrell will be on view this week at the Gagosian Gallery (London). It’s Turrell’s first exhibition with the gallery, which includes new installations, light works, sculptures and prints by the artist. The exhibition will be on view from October 13 – December 10, 2010. Vija Celmins will be part of Seductive Subversion at the Brooklyn Museum, which seeks to expand the definition of classic Pop art and reevaluate the role of women who worked alongside the movement’s more famous male practitioners. The exhibit will be on view October 15, 2010–January 9, 2011. Carrie Mae Weems‘s photograph May Flowers is part of Mixing Metaphors: The Aesthetic, the Social and the Political in African American Art, an exhibition currently on view at the Howard University Gallery of Art. The work is on view until December 17, 2010. Dazed & Confused‘s October issue features the photography of Collier Schorr, who shot the “face of the moment” actress and model Elisa Sednaoui. Work by Bruce Nauman and Martin Puryear are among several sculptures on view at the Nathan Manilow Sculpture Park, Governors State University (IL). The sculpture park is open from dawn until dusk all year. Landing by Elizabeth Murray is now on view at the Nerman Museum of Contemporary Art’s Foundation Gallery, Johnson County Community College (KS). Jessica Stockholder will speak at Nerman Museum of Contemporary Art as part of the third annual Jerome Nerman Lecture Series at 7pm on Tuesday, Nov. 2, in the Hudson Auditorium.